Last time we talked about the importance of having a clear portrait photo in your LinkedIn profile. Of course merely showing your face clearly isn’t enough. Your profile photo is not only there to make your first impression, it is also there to instil your qualities in the viewer’s mind. You’ve got to convey the right message with your expression. When you try to take your own photo, it is incredibly difficult to capture the right expression. Whether it’s because you’re used to the photo, or just not knowing what to look for, people who take their own photo often do not realise the message they are sending. We can’t show them here, but when we had a quick browse around LinkedIn for professionals in Sydney, we found some very poorly selected profiles. We found photos that looked forced, awkward, silly, messy, stand-offish, even hostile and angry. Some people use a candid shot to avoid looking awkward. Sadly these are often blurry, or you are looking off screen with a bored face. All it does is tell your viewer that you don’t care enough to take a professional shot. You’ve spent a lot of effort developing your brand, your website, your brochures and info pamphlets. Shouldn’t you spend an equal amount of effort in your profile photo? After all, your visual brand is interpreted by the brain 6000 times faster than your text. A celebrant should look kind and friendly. A real estate agent should look honest and knowledgeable. A programmer should look alert and intelligent. While a family lawyer should look approachable, a criminal lawyer should look strong and confident. Whether you are based on the North Shore or the Eastern Suburbs or Sutherland Shire will also have a small effect on how you should portray yourself. There is no one size fits all. If your photo is taken without any discussions, will the result be what you need? 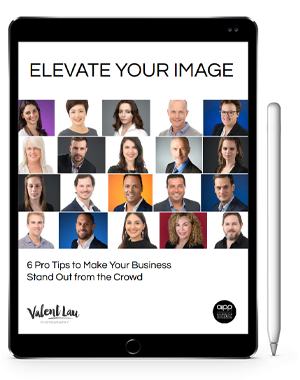 If your headshot doesn’t tell a message, and the right message, you are wasting your time. Before we create your profile, we discuss with you in detail the type of message you want to present to the world. We then carefully plan and capture the right expression to create the right impression in the viewer’s mind. When the viewer has a good impression of you, business becomes so much easier to discuss. How much would that advantage be worth to you? Valent Lau Photography provides Personal Branding Photography in our Coogee studio or at your business location anywhere in Sydney. Contact us now and let us help you make your best first impression. I went to Valent Lau Photography for our staff photos. Initially I was worried that the photos wouldn't be what I'd imagined, but it was fun and they all turned out really well! We ended up with something that everyone was happy with. It was good to feel comfortable and actually enjoy the experience; have fun and laugh. It was a genuinely great time.